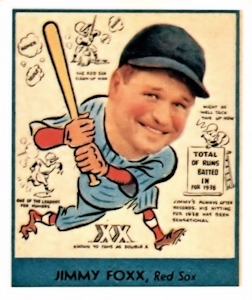 ON THIS DATE (October 1, 1938) ... Jimmie Foxx hit his 49th and 50th home runs of the season establishing a new Red Sox record for homers. The first home run came with two men on and the second one came with the bases full. In doing so he also broke the record for hitting two home runs in the same game for a season, the record he shared with Babe Ruth and Hack Wilson at eight each. The Sox got three runs in the third inning as Foxx hit his 49th homer with Doc Cramer and Joe Vosmick on base. In the fifth inning the Sox had the bases loaded. Gene Desautels had singled to right, Jim Bagby reached on an error and Cramer walked to fill the bases for Foxx, who slugged number 50. Pitcher Jim Bagby won his 15th game of the season. He started the season with a win over the Yankees at Fenway and finishes the same way with the 9-2 victory. Lefty Grove was presented with a Buick convertible before the game as one of the five best pitchers in baseball, as determined in a baseball poll by the Kellogg Company.